As any seasoned professional performer will tell you, performing a headline prediction is one of the BEST ways to get major publicity. 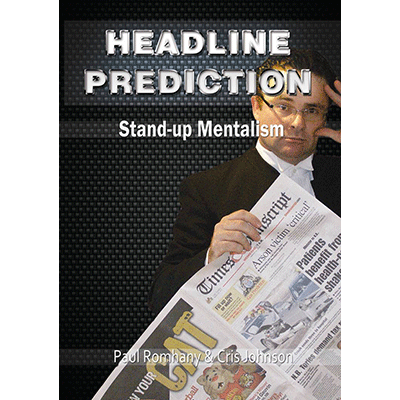 Tony Corinda said it best in 13 Steps To Mentalism, "the headline prediction almost always gets results in getting a story in print, because it is personal to the newspaper." Every time Romhany takes his one man show to a new city he gets FREE newspaper publicity because he involves a local celebrity AND a local newspaper. It is also a great sell to corporate clients as you explain to them they will become involved by being sent something that will be a feature in the show. In this book Paul shares his version, which has been in his professional act for over twenty years. It includes step by step instructions and photos that will show you exactly how to make this up. Effect: The magician posts a sealed envelope to the client a week prior to the show. At the show the client confirms it is sealed, and has not been tampered with. The performer brings out three different daily newspapers, and a spectator is given a choice of one. The spectator takes the newspaper with sealed envelope, and sits down for the remainder of the show. For the finale, the magician asks the spectator to bring the newspaper and envelope on stage. The spectator opens up the sealed envelope, and reads out the letter, which not only predicts which newspaper the spectator would choose, but also the daily headlines, and certain results of things that happened during the show. BONUS - Cris Johnson also shares his favorite Headline Prediction routine called, 'ConFab Headline Prediction.' This is the exact routine and method that Cris performs in his professional corporate show that uses headlines from the daily papers that are chosen by the audience. Effect: A sealed FedEx envelope is handed out to someone at the beginning of the program. At the end of the program, several local newspapers are handed out to audience members. At the appropriate part of the show, the performer encourages the audience to select their own headlines, phrases or even individual lines of an article out. Upon opening the sealed FedEx envelope the spectator finds another sealed envelope and inside is an index card that has all of the audience-selected material on it in as much detail as the performer cares to have. Both versions are practical and can be used under any working condition from intimate settings to stage work. Finally Paul Romhany shares a unique version using a prediction rolled up inside a poster tube, that can be used for a headline prediction or any type of prediction effect. This was used by Paul and his wife on board cruise ships for the past twelve years, as well as for solo headline prediction style routines. This unique method uses something most magicians own but Paul uses it in a very different way.